Almost five years ago I was training for my first photo shoot. Using traditional body weight exercises to push and pull my way to a better body. These were extremely tough but netted great results. 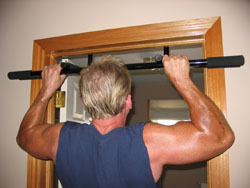 My chin up routine consisted of wide, medium and narrow grip chin ups. I could squeeze out 70 total reps in slightly less than an hour. The following year was my next photo shoot. 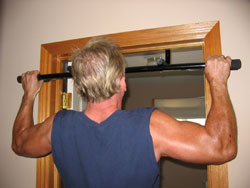 I followed the same chin up format. This time I reached a total of 180 reps in about an hour. My next shoot is not until the summer of 2006. It will be a video this time, so I am just training to obtain a good base for next year. The following route is completed in 30 minutes for a total of 180 reps. You will notice I not only cut the time in half but I added a 25 lb plate hung from my body for the first 6 sets of chin ups. Today my base workout is at 2.5 times the volume, at half the time with additional weight. This is tremendous personal growth for me. Some may ask how you can achieve such consistent gains from year to year. If you have followed my articles you will know I believe in basic exercises like chin ups and dips with a healthy diet, rest and plenty of water. More energy and faster recovery are things I understand and see from the Lifewave Energy patches. You may want to try these patches and you can buy them directly from Lifewave, click on the icon and go to the retail store on their website. They have a money back guarantee if you do not see any results from their products. Strategy #1 - Focus on strength. For the 1st four months of the year try to get stronger. This is done increasing the difficulty of the exercise while being able to perform between 3 & 5 reps per set. 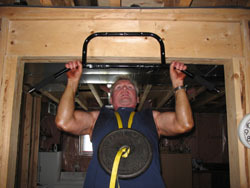 To increase the difficulty widen your chin-up grip or add weight or both! You will need to rest as long as 3 minutes between sets. That means a 30 minute workout will contain about 10 sets and a total rep count between 30 and 50. Repeat this work-out (with a few added reps) every 3 days (72 hours). After about 4 or 6 weeks increase your days rest to 4 days (96 hours) and then 5 days (120 hours). The reason behind the progressively longer rest periods between workouts is to help in recovery as you push your strength limits. Each week you should be able to increase your total rep count by 2 or 3 reps, no more than that. Once you cannot increase 2 or 3 reps per workout it is time to increase your rest between workouts. After you have progressed to 5 days rest and cannot add 2-3 reps to each workout you have maxed out your strength training. Strategy #2 - Build muscle. The second part of the year will be devoted to adding some muscle size to your frame. The strength you have gained in the first few months will be critical in building muscle. Now you will be performing between 6 and 8 reps per set with a rest period of no more than 2 minutes between sets. This means that a 30 minute workout will have 15 sets and a total of 90 to 120 reps per workout. 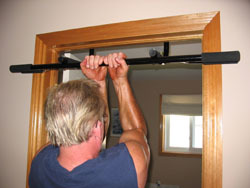 You will have to adjust downward the difficulty of your exercises by either narrowing your chin up grip or decreasing the added weight or both. Follow the same format for rests between workouts as the strength routine. As with the strength routine you will increase your total rep per workout by 2 or 3 reps, no more. You will have maxed out your muscle building capacity when you cannot increase your total reps even with 5 days rest. Strategy #3 - Build endurance. The 3rd part of the year will be devoted to increasing your endurance. This will lean you out and harden your build making it more dense. The strength and size obtained from the previous 2 strategies will be built on to accomplish this. For this part of the year you will be performing 6 to 10 reps per set with a rest period of 1 minute or less. This means a 30 minute workout will have 30 sets and a total of 180 to 300 reps per workout. You will have to adjust downward the difficulty of your exercises by either narrowing your chin up grip or decreasing the added weight. 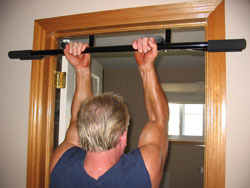 You have already decreased the difficulty of the chin ups so that you have only 2 or 3 narrower grip chin-ups available. If this is the case you will have to modify this section by performing 4 to 8 reps per set. You will need to keep rest periods between sets at 1 minute or less. Your modified total for an endurance workout will be 30 sets and a total of 120 to 180 reps. Follow the same rest format as the strength and muscle building routines. When you can no longer add to your total reps even with 5 days rest you have maxed out your endurance building capacity. This strategy is mapped out evenly for the year only as a matter of importance to obtain the 3 key elements of muscular fitness. These are as outlined: muscular strength, size and endurance. Typically the strength building strategy will be the longest in view of making gains from workout to workout. The muscle building strategy usually lasts half as long in view of making gain from workout to workout. Lastly the endurance strategy will be even less. This means if you make strength gains for 3 months before you max out, the muscle building and endurance strategies may only last 6 to 4 weeks respectively! You may repeat the above strategies several times a year if necessary. I started working out with a purpose in my late 40's and now continuing into my 50's. 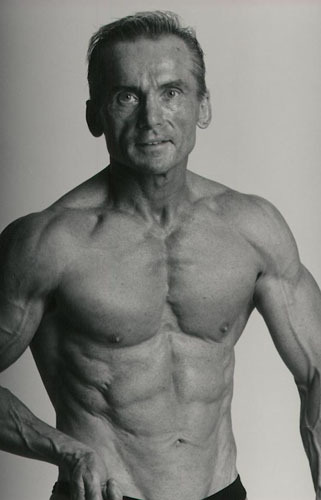 A healthier, more muscled, energetic body is possible even at 54 years of age. Believe in yourself and start a consistent home based workout system.